It's the end of October. Halloween beckons. Time to feed your Gothic. 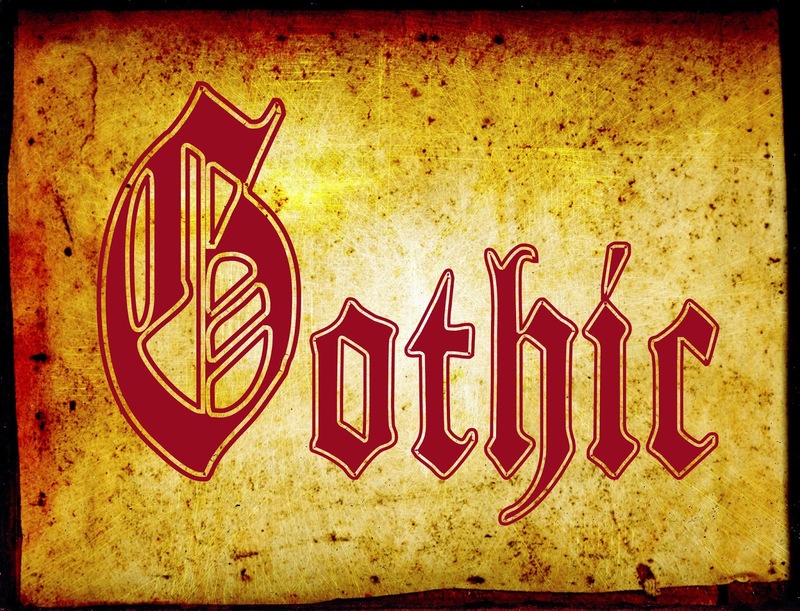 But what actually constitues Gothic? Gothic started its life in medieval religious architecture, a highly decorated style coming out of the Romanesque, even though the term 'Gothic' didn't arrive until the 15th century when in Italy it came to epitomise anything barbaric. The script itself is truly referred to as Black Letter, and comes in many forms. It was Guttenberg's early presses that brought it to the populace, but not until the 19th century, during both the Gothic Revival in architecture and the explosion of the Industrial Revolution, did it come into its own. Penny Dreadfuls - lurid tales aimed to make the heart race - were often set in ancient decaying buildings or the tenement warrens rural workers found themselves crammed into in the growing cities. Life was both bewildering and dreadful. Reading about worse put their own into managable perspective. Perhaps it does our own. Modern Gothic reflects our own lives, our own wishes, our own fears. We might be more comfortable than our 19th century forebears, but our need to overcome, to make order out of chaos, remains as strong. How do you feed your Gothic? Feed it a little more. Fantastic Books Publishing is currently running a short story competition - 666 precise words to chill readers to the bone. Its accompanying promotional video will certainly give you sleepless nights. A week ago I was at Eden Camp just outside Malton in North Yorkshire. It's a modern history theme museum constructed in the 30+ huts of an original Prisoner of War camp built in 1942. It's not the place where politicians or brigadiers are seen to pontificate; it's dedicated to ordinary people who were caught up in the conflicts of the 20th century. I was attending a reunion of the Veterans of Palestine - members of the British Military forces and British members of the Palestine Police who served in the region up to 1948 when the British Mandate terminated. As can be understood, there weren't a great number attending. I was there because my late father-in-law had served as a Palestine Policeman 1936-43 when he had been shipped back to England due to injury, and from there sucked in to the war in Europe. When bereaved many years later, my husband had encouraged him to write down his experiences, and recently we came across a thick ringbinder. Some of those experiences we had heard, the often humorous anecdotes, but much of it was new to us - and now it is too late to ask for futher details. Upon arriving at Eden Camp we went into the Canteen for refreshments. After we'd sat at one of the long tables an old man tottered by us, his cup of tea slopping on a tray held in unsteady hands. I watched to make sure he managed to set the tray on his table without mishap. He did so, and took his seat with some relief. Perhaps it had been a long journey; perhaps it had been just a long walk from the counter. He was a thin man, not tall, his tie slightly askew above an open collar button, his hair standing out at odd angles. As he made himself comfortable he pulled something bulky from a pocket and placed it on the table beside his tray. 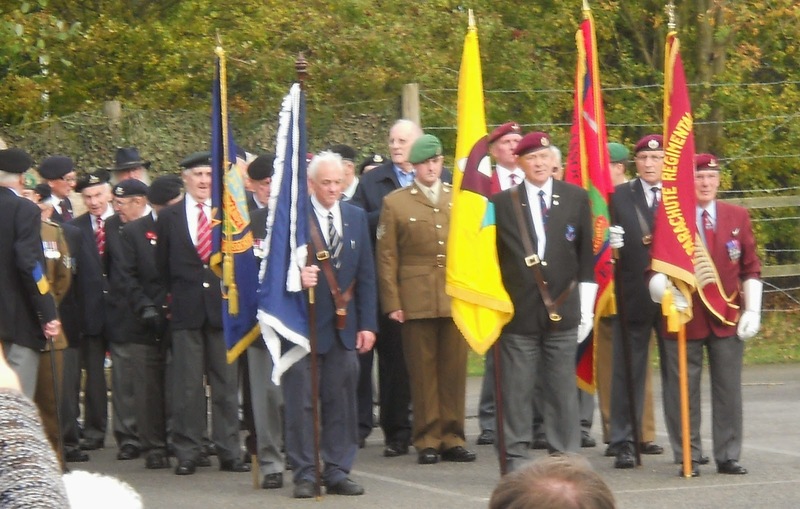 It was the maroon beret of the Parachute Regiment. Too often we look at someone, even someone close to us, and see them as they are now, not the wealth of experiences they have both enjoyed and endured. Do you have someone close within your circle, someone who was conscripted into the National Service, perhaps, was in Malaya, or Korea, or one of the many other conflicts that have beset the world since the end of World War II. What about their stories? Time to ask, time to commit to paper, may be shorter than you think. 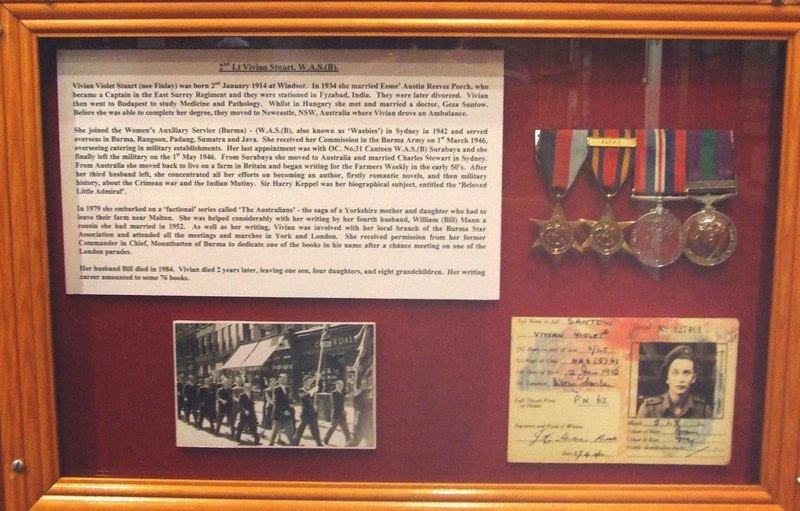 Adendum: Just to emphasise the theme of this post, while looking through the photographs taken on the day I came across this, one of many boxes adorning the walls in the Medal Room of Eden Camp. At the time of taking the photograph I didn't recognise the name in context, but Vivian Stuart - 2nd Lt Women's Auxiliary Service (Burma), the "WASBs" - was a founder member of the Romantic Novelists' Association, and someone I recall from writers' conferences in Scarborough when I was making my first forays into writing fiction for magazines. I recall her as a tall, rather austere-looking lady often seen wearing tartan trews. If I'd had the nerve to approach her, think what other memories I might now be carrying. A week ago today I was in Durham on a research jaunt for Book 3 of the Torc of Moonlight trilogy. While picking up a brochure for the city’s Litfest on at the time I bumped into a gent from The People’s Bookshop. We exchanged postcards, as you do. What he failed to mention was that the premises was down a ginnel and up three – it could have been four – flights of brown-painted stairs which in sections twisted on themselves in keeping with the age of the interesting building full of odd, and unfortunately locked, wooden doors. I must profess to being intrigued by interesting buildings. I was followed by two other prospective customers who toppled into the bookshop on my heels. Between drawn breaths they asked if oxygen was provided free, and everyone chuckled. If not oxygen, the shop has a handy grouping of cushioned chairs, but by then we were browsing the shelving. The People’s Bookshop, down Saddler’s Yard, carries a host of out of print and radical titles. Browsing was both a revelation and a joy. If you have a spare half hour do call in. You might do more than just say hello. Today is Event Day for Books Are My Bag, where bookshops up and down the country are festooned in orange and authors are meeting readers and... you know how it goes. 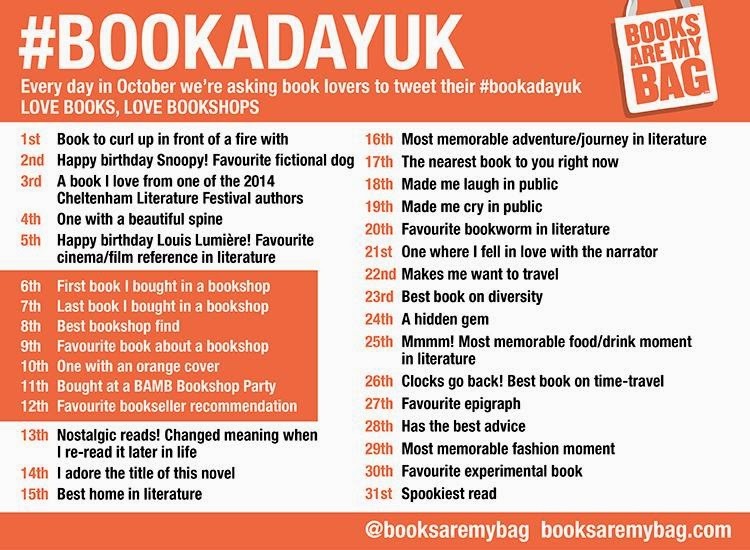 The #BookADayUK Twitter stream will be full of intriguing titles found and purchased. I thought I’d concentrate on books already in my care, two in fact, brought to mind because the clear blue sky seen from my desk is full of skeins of geese – pink-footed, greylag, Canada – all heading south for the winter. They are flying low over the roofs intent on stopping at the mere at the edge of town to rest and feed on what’s left in the cereal fields. 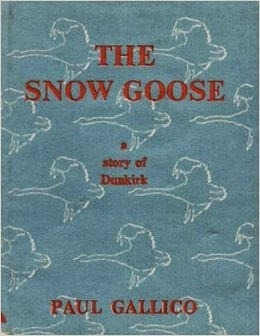 First title up has, of course, to be The Snow Goose by Paul Gallico written during World War 2. Condemned as a sentimental tear-jerker by some critics (who listens to them?) it was the first book I read where I was aware of – and took on – the use of metaphor and symbolism. Years later I attended a litfest to hear the fascinating story of William Fiennes. Recuperating from a debilitating illness in his teens, the birds beyond his window became his mental lifeline to the world, and Paul Gallico’s book an inspiration and a goal for health: he would follow the snow geese on their annual American migration. 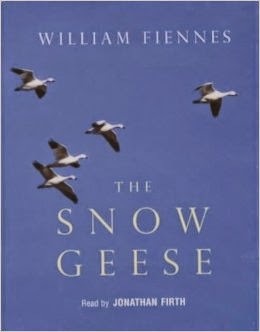 The Snow Geese is the result – a fascinating travel book of both man and bird that I can heartily recommend. We do though, don't we? Judge books by their covers. It's the very reason indies like me hire professional cover designers, why the design team of mainstream publishers coordinate their efforts with that of the marketing department. Take, for instance, this poor specimen found while moving bookcases and giving the incumbents a long overdue clean. Slightly foxed, its corners a bit battered, on a stack in a second-hand bookshop, I wouldn't give it a second glance. And I doubt you would, either. It was already halfway to the pile for a charity shop donation when I read its spine: Painting A Portrait - De Laszlo. Inside, it was a revelation. Not for its content, but for the craft of the book-maker. 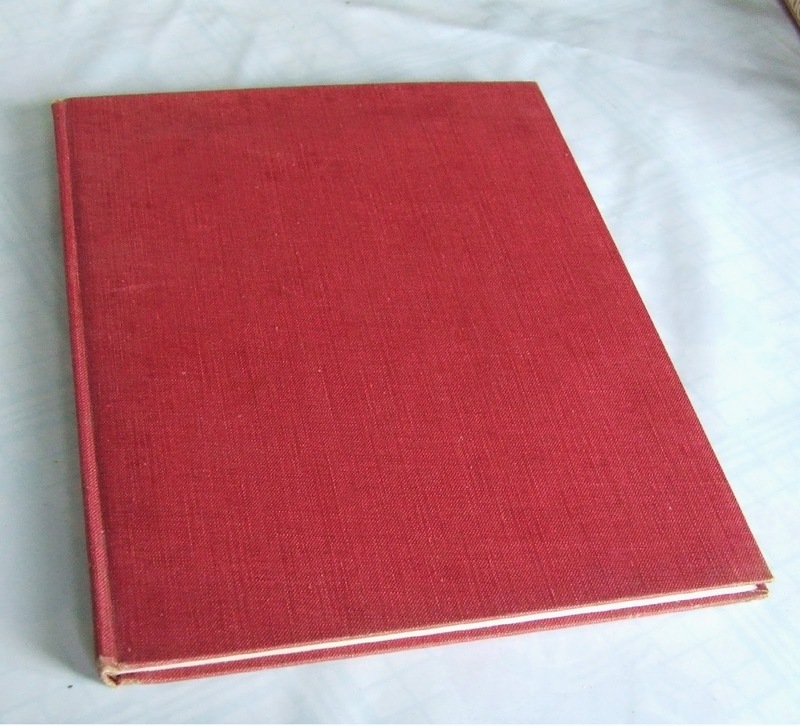 First published in 1934, I was holding the 1947 Fifth Impression, 'printed and engraved in England'. Think about that. It was two years after the end of World War II. Britain was still on rationing, and would continue to be so into the 1950s. Most of the pictures - and there are a lot of them - are in b&w. I've picked out a colour below. Take a good look at it. That image, printed on glossy paper, has been hand-glued along one edge. Hand-glued. Every print is the same. The artist's palette of colours is reproduced in eye-smacking brilliance that my camera doesn't do justice to... specially prepared for this volume by Winsor & Newton Ltd. And somehow it is in 3D. Running a fingertip over the brush marks, it feels as though it is dried paint. All in all, it is a masterpiece of the bookmaker's art. Let's hear it for old-fashioned bookmakers. And Mr de Laszlo? Oh yes, Mr de Laszlo. It might be a how-to book, but he was certainly no how-to painter. The Beverley Literature Festival is in full swing, and at the weekend I attended a Crime panel discussing Fiction v Reality. Anya Lipska’s novels give insights into the London Polish community where she lives; Mari Hannah writes fiction set in her native Northumbria with research help from Mo Dowdy, a former DI on the Serious Incident Squad; David Mark, hosting the event, was fifteen years a journalist, seven as a crime reporter with the Yorkshire Post and sets his novels in Hull. Their discussion was lively and informative, veering from the emotionally serious to the light-hearted as aspects of their writing were unpicked. Each had faced opposition from mainstream publishing for their settings, though none could imagine conjuring a fictional town or city – it would be far too much work – and they agreed that TV programmes not only glossed over much police procedure but escaped with anachronisms that would be hounded as fantasy in novels. I understand their, and their readers’, need for reality. It’s something I take pains to imbue in the Torc of Moonlight trilogy, even having a handy ex officer reading the police sections to ensure authenticity. Crime, Mythic Fantasy... both are about people set in a contemporary world. Writers should always be faithful to their subject and readership, and to be honest I’ve never met one who wasn’t. 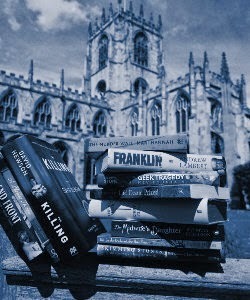 The East Riding of Yorkshire's Beverley Literature Festival continues until 11 October. If you're in the area, don't miss it. I am an unashamed e-reader – of fiction – but it wasn’t always the case, and even now I prefer my non-fiction paper-based. I’ve always loved books, the sense of information encapsulated ready to hand, and even as a child I knew I wanted a ‘library’, holding my books among others. Actually I wanted a castle, or at least a castellated house, because such wonderful buildings always had libraries. I coveted Abbotsford, the home of Sir Walter Scott, situated near Melrose. We had visited during a family holiday and I’d found its huge library and Scott's study awe-inspiring. At that time his writing room held not only books on two levels but a whole array of fascinating collected artefacts. I had a fossil; I’d made my start. Dreams of a castle, even a castellated house, faded into obscurity – mature minds tend to consider the enormity of heating bills and the never-ending dusting – but from the moment I had a place to call my own I collected books. And kept collecting them when funds allowed. After all, if I passed up the chance to buy that volume on the history of nursery rhymes (Cinema Bookshop, Hay on Wye, long before any Literature Festival) where would I be when I needed the information it contained? And did you know that Jack and Jill weren’t called that when they originally went up the hill, ostensibly for water? But I digress, just as my widening collection did, and my ill-fated card-based catalogue. Even the shelving system based on a historical timeline fell foul of lack of shelving. Stacks ensued; focus shifted. This summer’s re-lacquering of the wooden floors has meant the stacks have been moved, the bookcases unloaded. As the books are cleaned to be rearranged in loose order forgotten gems spring unbidden: Monastic Britain (with maps! ), Life In The Age Of Chivalry, Britain Before The Norman Conquest (more maps)... just the information I need to help with book 3 of the Torc of Moonlight trilogy. Finding old friends is a wonderful moment, each eager to impart anew its wonders. I’ve set them, and others, aside. I’ll never get the rest cleaned and replaced if I start reading. Which ‘old friends’ have you recently become reacquainted with? What constitutes your library?